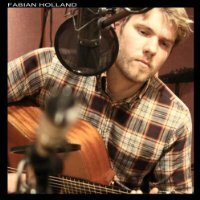 Fabian Holland is due to release his self titled debut album in early October. He's been playing music from an early age and as well as studying music in the UK, has spent time abroad developing his musical style. The album is quite simply arranged - it's mainly just Fabian Holland singing and playing acoustic guitar, but where other elements are needed he has other musicians contributing with Double Bass, Fiddle, Melodeon or Harmonica. A simple arrangement like this really does strip the songs down to the bone, and with just the guitar and vocals then the strength of the song is critical - a weak song will fall flat, but good songs can sound great. Happily the songwriting here is excellent and it all works beautifully. There are a couple of traditional songs on the album - "Dr Price" and "Banks of the Dee", but my favourite by far is one of Fabian Holland's own songs - The landlords daughter. This is an excellent album - some beautifully written songs performed simply but brillantly.